I am slowly starting to incorporate the liturgical calendar into our lives. My husband and I did not grow up that way, so we are learning as we go. Today is the Feast of Our Lady of Guadalupe. Since I work in pro-life ministry and help women in crisis pregnancy, she is very dear to me as the Patroness of the Unborn, and the Americas. For this Feast Day, I am going to make a Mexican (an American version, really) Taco Salad for dinner. I like tailoring meals to feast days. Perhaps I will cook more authentic meals once I get the hang of remembering certain feast days. We will then read the story of St. Juan Diego (whose feast day is December 9th) and Our Lady of Guadalupe. It is a beautiful story. I actually have a friend who went to the shrine of Our Lady of Guadalupe on a pilgrimage this week. What a blessing for her! I will also dedicate my daily Rosary to her and to the protection of the unborn and healing for victims of abortion. Since I am new to liturgical living, I will keep things simple. Do you have traditions for the Feast of Our Lady of Guadalupe? I am always looking for ideas. Advent blessings! 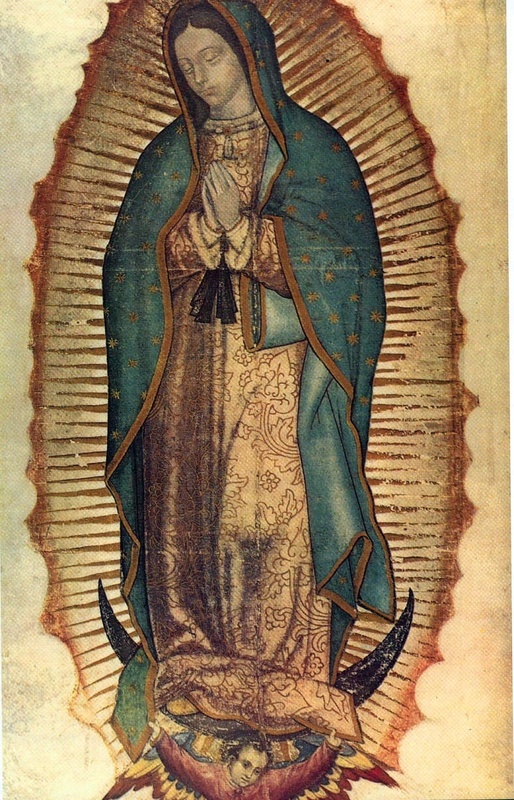 Our Lady of Guadalupe, ora pro nobis. What recipe do you use for the cookies?